On the 4th of July 1944, James Allen Flood was born in Philadelphia, Pennsylvania. He moved to Miami in 1961, graduating from Miami Jackson High School the following year. In 1965, he joined the Navy, serving as Quartermaster on the command cruiser U.S.S. Wright, then the destroyer U.S.S. Laffey. From 1967 to 1969, he served aboard the battleship U.S.S. New Jersey. Upon returning to Miami, Mr. Flood earned an AA degree in Art from Miami-Dade Community College. He worked as a sailing instructor and a deck hand on a Miami River tugboat before joining Eastern Airlines in 1974. He was in Eastern’s art department when the airline ceased operation in 1991. Mr. 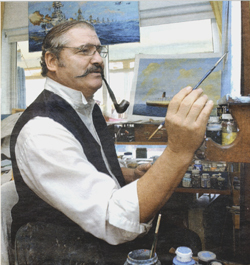 Flood enjoys membership in the Naval Institute and the American Society of Marine Artists. His work is on display at the Naval Institute in Annapolis, the Wiley Post Museum in Oklahoma City, the Olympia Memorial in Philadelphia, the battleship Alabama in Mobile, the Biscayne Bay Harbor Pilots in Miami, the Washington Naval Historical Museum, the Queen Mary, the Mystic Seaport and the Historical Museum of South Florida. His art has appeared in the Naval Institute’s Naval Magazine, Steam Boat Bill, and the Journal for Steamship Historical Society of America, Pictorial Histories, Sea Classics Magazine, and Military History Magazine. In 1996 he was invited to visit the Duke of Edinburgh aboard the Royal Yacht Britannia in order to present his painting of the yacht, to the Duke’s Trust. His Paintings have been used in the sets of a 20th Century Fox film, and at the Memphis Exhibition on the Titanic in 1997. He is an accomplished musician and an avid maritime historian.